John Schmidt has been teaching kids the basics for 27 years. He has been a private pilot for almost as long. Each summer he combines the two skills with his Intro to Aviation class. Children 10 to 14 get a broad view of flight with a three week course. John also flies for the Young Eagle program, providing kids their first taste of flight in a small aircraft. He was in charge of the program at the August 20th Forest Lake Airshow where 170 kids got FREE airplane rides. He has also personally conducted 170 of the 1.6 million flights that have been flown since 1992. Land of 10,000 Stories: WWII glider reborn in Minn.
KARE TV (Ch 11) ‘s Boyd Huppert did a nice job of explaining the G-4 glider construction project. You’ll see several of the folks working on the project, including Dale Johnson. See other Metropolitan Airport Commission videos for Flying Cloud and Anoka on the MetAirCommission Channel on YouTube. Download the latest issue of On Final now. It contains a story about Niels Sorensen written by Norm Tesmar, photography tips by Peter Denny, and the introduction of a Chapter 25 history project. The newsletter also contains dates, times and directions for three upcoming events: June chapter meeting, the Annual Chapter Picnic, and the June Young Eagles. Download the June On Final now. Each year, Chapter 25 awards a $500 scholarship to a Lakeville High School student. This year’s winner is David Stark. David will be attending the University of Minnesota in the fall. David joined us on May 20th at the Chapter hangar at Airlake for an airplane ride. This year we have awarded our Air Academy Scholarship to Raynor Poehls. 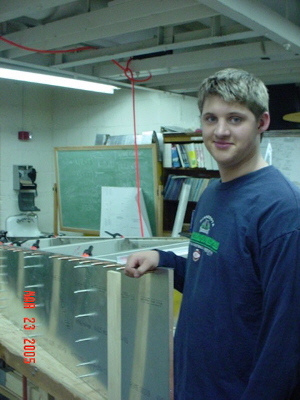 Raynor is a student in Peter Denny’s aviation class at Washburn High School in Minneapolis, where he has distinguished himself as a class leader in the construction of Washburn’s Sonex project. Raynor will attend the EAA Advanced Air Academy, which provides an atmosphere for students to become totally immersed in the world of flight. Ground instruction and introductory recreation flight experiences highlight this meaningful, action-packed camp. It combines “in-the-air” and “on-the-ground” hands-on activities. Blue Horizon designed by Kaushal Sheth.